As technologies to tap the sun and store its energy become more efficient, we are already on our way to an ­incredibly ­energy-affluent world. And chances are we might arrive there before ­development driven by fossil fuels brings on a ­c­limate-change apocalypse. In the near future, the sun will come clo­ser to you—so will the wind take up residence nearby. In a friendly neighbourhood battery, that is. The lithium-ion battery that runs your smartphone today could soon power Indian homes, cars and offices alike. This isn’t the stuff of science fiction, but a reality in the making. It already is a reality, for a small percentage of homes in countries such as the US and Germany. 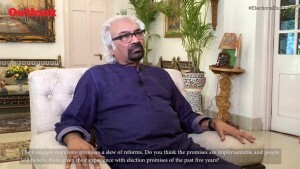 The scenario is doubly tempting: one, because of the vastly improved ways in which the Indian sun will soon be harvested; and two, because of how the big push towards renewable energy is accompanied by a technological leap in batteries­—how they can trap, store and deliver power. As India battles perhaps its deepest conflict—how to move towards an energy-intensive future without imperilling that very future—the path has to inevitably lead away from fossil fuels to renewable sources of energy. But how does one make, say, solar energy available on tap? It’s a field that has for long been marked by an infuriating blend of sheer plenitude—what could be more abundant in India than sun’s rays?—and a poverty of means. And its inherent lack of constancy is what had always hobbled solar energy. But what we are about to witness is a new paradigm: renewable energy being paired with the means to store it. Investment in batteries, therefore, is a necessary concomitant. Another moving object in the mirror that’s closer than it appears is electric vehicles. A future built around all this has its prophet in the shape of Tony Seba, Stanford academic and author of Clean Disruption, and he sees it all coming to fruition in just three years. Nowhere is the potential bigger than in India. At the Vienna Energy Forum in May, when former power minister Piyush Goyal went up the dais to address the event, he was introduced as a minister of a country that’s at the centre of the “largest energy transformation project in the world”. Solar, wind and electric cars—the big three—are already hogging a rising share of India’s energy investments. The news, by any reckoning, is heartening. Global energy forecasters predict clean energy will push out dirty coal soon and, India and China, the two nations most hungry for energy and often villainised for prioritising growth over environment, may be the ones to lead the real green revolution. The lithium-ion battery—the smallest part of the bigger game—is the powerhouse that’s really undercutting fossil fuels. If one were to string together a clutch of ­recent policy announcements and targets, then it’s apparent that India aims to be one of the world’s greenest economies. However, none of India’s goals will be successful if it can’t manufacture what appears to be the final frontier of energy: super-efficient batteries to store, reuse and integrate renewable power into the mainstream, or the national electricity grid. So the powerhouse that’s really undercutting fossil fuels is the lithium-ion battery. The smallest part of a bigger game is increasingly becoming the most significant. India’s approach offers quite a contrast to that of the US—President Donald Trump has refused to back down on coal power—and it aims to be one of the world’s greenest economies in less than 15 years, according to Bloomberg New Energy Finance’s New Energy Outlook 2017. The targets are a bit awe-­inspiring. In the 2015 Paris Climate Agreement, India surprised the world by committing itself to reducing emissions per GDP unit by 33-35 per cent from 2005 levels by 2030. China declared a 60-65 per cent reduction target—and the US only 26-28 per cent. The targets achievable by 2022—the next five years—include 175 GW from renewables. Of this, 100 GW will come from solar, 60 GW from wind, 10 GW from biofuels and 5 GW from small hydropower. All this will feed into one larger target: 40 per cent of India’s energy requirements will come from non-fossil fuels by 2030. That’s so ambitious that some sce­pticism is legitimate. Prime Minister Narendra Modi’s most transformative plan, after all, may not be about going cashless. How about a plan that seeks to ensure every new car that hits the roads is an electric one by 2030? Road transport minister Nitin Gadkari had said in September that car-makers must turn to electric vehicles or else he would “bulldoze it”. The multiplier effects can’t be overstated. Carbon emissions down, pollution down, precious forex saved (oil is India’s biggest import item). Lower ­imports will show up as higher GDP and a robust balance of payments. Early in this government’s tenure, when NITI Aayog unveiled its renewable electricity roadmap 2030, markets got the signal. Ramesh Kymal, CEO of Siemens Gamesa, one of the largest renewable energy infrastructure firms in the country, says his company has grown so fast, nearly 100 per cent a year, that the firm had to set up a fifth additional plant to meet demand. (The difference between the bullish scenario it enjoys in India and the sluggishness elsewhere is captured best by the fact that the firm had to lay off 6,000 workers globally last week and its stocks fell on news of missed targets). “The awareness is now clear that wind and sun are resources not to be wasted,” he says. Land for the additional plant in Nellore was cleared in 15 days by the state government, as states are now fiercely competing for projects. The tipping point was India’s decision to build the world’s largest solar power plant of 750 MW in Rewa, Madhya Pradesh. When the Rewa Ultra Mega Solar Limited was announced as a joint venture between the Solar Energy Corporation of India and Madhya Pradesh Urja Vikas Nigam Limited, few imagined the ground-breaking impact it would have. The marathon online auction lasted 33 hours, involving some of the biggest global solar firms. Three winning bidders—Mahindra Renewables, ACME Solar, and Solenergie Power—put up bids to outdo competition such that the quoted per unit cost worked out to a low Rs 3.30, ‘levelised’ for the next 25 years. The first-year tariff was even lower: Rs 2.97 per unit. It was a historic deal. It made solar power nominally cheaper than thermal energy for the first time in India. (The state-run NTPC’s average electricity price is Rs 3.30 per unit. To imagine the drop, consider only the fact that solar power cost Rs 12.76 per unit in 2011. Rewa will be the first power project to conduct inter-state sale of solar power. A big consumer will be the Delhi Metro, for which it will mean big savings—it pays Rs 4.30 per unit at present. The larger target of PM Modi’s plan is ­ambitious: non-fossil fuels will serve 40 per cent of India’s energy needs by 2030. Following Rewa’s model, the projected cost of the Bhadla solar park in Rajasthan slipped to Rs 2.90 per unit. There, the Rajasthan Renewable Energy Corporation Ltd has entered into joint ventures with the Saurya Urja Company of Rajasthan Ltd for a 500 MW plant, while the Adani Renewable Energy Park Rajasthan Ltd is developing a 250 MW capacity park. The importance of costs can’t be undermined. 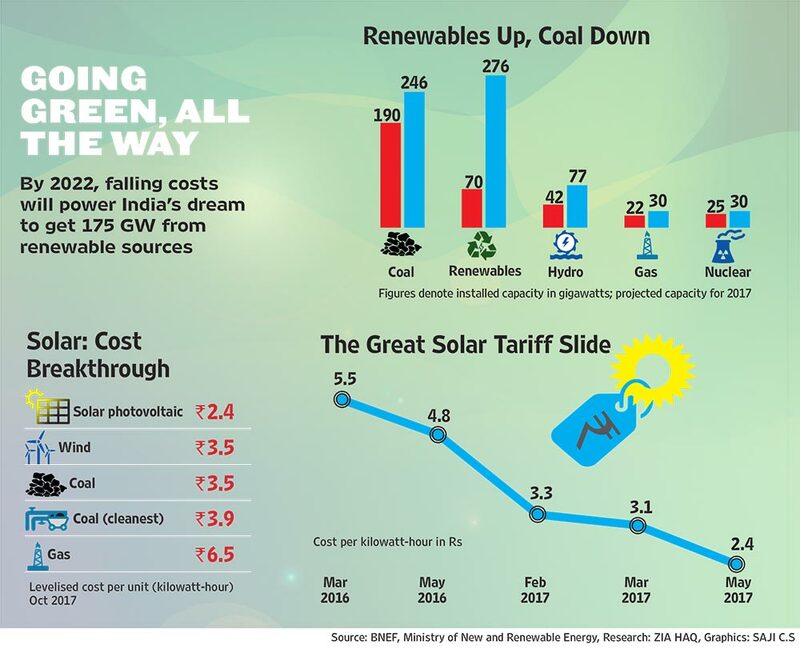 India had piled up more installed capacity of renewables in the five-year period between 2009-14 than a marketable demand for it precisely because the price breakthrough was elusive. High costs globally are the biggest bottleneck in the adoption of technology. In fact, a technology isn’t scalable as long as it is not affordable. How did India pull off it off? It’s not just fierce competition that made the three Rewa firms come up with a historically low quote price. It’s the business model worked out by the Solar Energy Corporation. “Efficient power-purchase agreements” or ­EPPAs, assured offtake of electricity and guarantees by the government are the main reasons behind the cost breakthrough, says the corporation’s top executive Ashvini Kumar. EPPAs mean robust and steady demand that matc­hes profitable pricing arrangements with consumers. It’s like working out an assured market well in advance. States such as Gujarat, Andhra Pradesh, Uttarakhand, Karnataka, Rajasthan and Tamil Nadu now have competitive policies to promote solar energy from rooftops. And among ­Kerala’s showpieces in the field is a floating solar plant at Banasura Sagar reservoir, Wayanad. The other leg of India’s renewable push is electric cars. What links this to the solar dream is the use of batteries. Vinod Dasari, outgoing president of the Society of Indian Automobile Manufacturers, says achieving India’s ‘electric dream’ will first of all need an incentivised policy for batteries. Tony Seba, the futurist, foresees a kind of pattern in the coming clean-energy boom—nothing short of exponential in his view. In a presentation in June at the Clean Energy Action in Color­ado, Seba showed why the world could change in just 15 years. “Technology never gets adopted in a linear fashion. Technology gets adopted in an S-curve (see graphic),” he says. Citing historical exa­mples like that of colour TV, Seba says initially the curve moves sideways. Plotted on a graph, the relatively flat arc of the curve denotes a phase of flat demand initially, mainly because prices are high. Gradually, the rate of adoption begins to pick up pace, with falling prices. It then hits a tipping point where costs fall substantially and utility rises. The adoption curve rises exponentia­lly here before peaking and tapering off. What helps the costs to fall is the famous Moore’s law: on a dollar basis, computing power doubles every two years, enabling cheaper products. 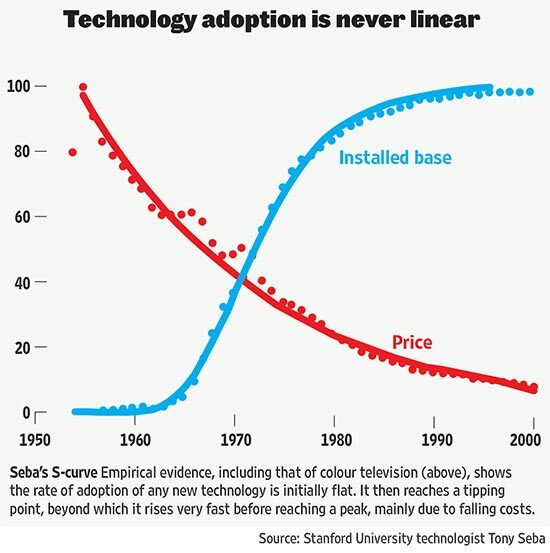 Seba’s research shows the S-curve in adoption of technology is getting stee­per, meaning the point at which ­adoption just takes off is reached faster. Around the 1900s, the curves were flatter for a longer time before rising, meaning adoption took longer. Now, the upshot of Seba’s prediction: clean energy has already reached the tipping point in mid-2017, according to him, and adoption will now rise relentlessly. He sees a global transformation, rather than one merely concentrated in China and India, countries with the biggest solar energy targets. The next round of bids in India’s solar push is being billed as ‘solar plus’. It’s policy jargon for solar power generation bundled with storage technologies in the form of batteries. Launching the first storage tender, NTPC has invited bids for 625 MW of solar projects with a ­storage component. The Solar Energy Corporation too has floated bids for 750 MW of installed solar capacity at Ananthapur­amu Solar Park in Kadapa district of Andhra Pradesh, along with storage. The tipping point was ­India’s ­decision to build RUMS, the world’s ­largest solar power plant (750 MW) in Rewa, MP. What do these policies mean for a con­sumer? “As technologies achieve scale precisely through these policy changes, firms will naturally bring storage to individual consumers,” says Prof Achin Rai, a consultant to the Central Electricity Authority. Take US electric carmaker Tesla’s Powerwall, a new portable home battery. It independen­tly powers a consumer home round the clock by storing excess solar energy and making it available on demand, even after the sun has set. Powerwall is connected with a smartphone app, and can detect a grid outage, which makes it automatically disengage from the grid and take over. “You will not even notice that the power went out and provide a week of power supply,” Tesla’s advert says. Globally, batteries are indeed becoming the linchpin of clean energy. Elon Musk, the foun­der of electric car firm Tesla, is working on new battery technologies that can feed into national electricity grids. The first client is set to be Australia. Storing electricity in batteries during off-peak hours and pumping it up during peak is the key. Much of the new research is focused on making renewables grid-compliant through storage. “Grid compliance” means using the existing countrywide electricity grid to draw renewable energy. The next leap is towards industrial-scale lithium-ion battery banks. Once aligned to the national grid, they can automatically fill in with power when the grid is running low. For consumers, smaller versions or behind-the-meter versions can store power from renewables and be used during night. In Germany, residents store unused power and sell it back to the national grid. India is gearing up to enable cost-effective domestic manufacturing. “The government’s next big thrust is to spur battery manufacturing,” says Anand Kumar, secretary in the ministry of new and renewable energy. ‘The next big thrust of the government is to spur battery manufacturing,’ says A. Kumar, secretary in the renewable ­energy ministry. The public sector is turning to the most dependable institution available: ISRO. Its batteries have ensured India’s iconic satellites work glitch-free in space. 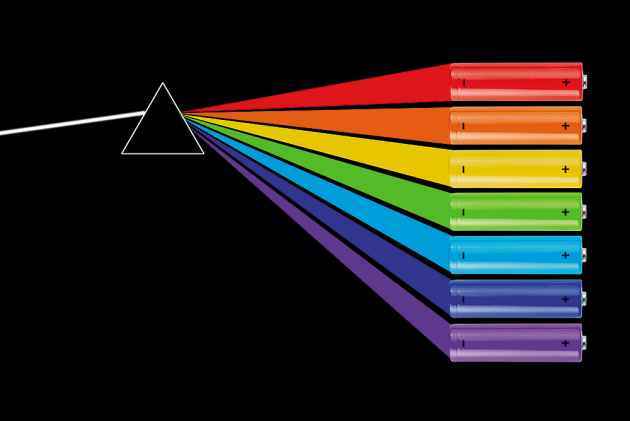 Earlier this year, the Vikram Sarabhai Space Centre and the Automotive Research Association of India tested a new line of lithium-ion batteries. The technology is expected to be transferred to the private sector through a newly proposed central age­ncy. One public sector firm, BHEL, has already been identified as a potential commercial arm. Alongside, the private sector is clinching deals in the battery space. Swiss battery-storage solutions provider Leclanché SA has planned a joint venture with Sun Mobility for battery solutions. Suzuki Motors has announced plans to invest Rs 1,500 crore in a lithium battery plant at its industrial campus in Hansalpur, Gujarat, the company said in statement in September. Another big project is a Panasonic and AES joint venture to set up a 10 MW energy storage facility in Haryana. India’s push for renewables is no isolated mission but comes as a cross-agency strategic thrust to cut down pollution and the oil import bill, which is set to double in a decade if renewables don’t fill in, according to projections of the finance ministry. The draft 10-year National Electricity Plan states that India doesn’t need any new coal-fired power projects at least till 2027. To be sure, the idea isn’t to dump coal altogether but to have an efficient energy mix of renewables, hydro and coal, with a gradual winding down on fossil, says Prof Rai. There’s another motivation—as of now, according to the World Bank, at least 300 million Indians still live without electricity. A recent study by the Council on Energy Environment showed how the provisioning of a 2 kWh off-grid solar photovoltaic system for over 570 primary health centres has changed lives in Chhattisgarh. The study, based on an assessment of 15 districts, showed facilities with solar power recorded 50 per cent more hospitalised baby deliveries than “power-deficit rural health centres”. That’s a far more crucial public good than fancy electric cars. Finally, power will course through India’s social grid too. As the government's focus has shifted to R&D at ISRO's Vikram Sarabhai Space Centre, centre's director Dr K. sivan says that the process of transferring the technology to industry for use in electric vehicles is on. Cheaper and better batteries are set to revolutionise the concept of energy storage. Here is the tech spark that triggered the illuminating possibility of clean energy. Union Minister for road transport and highways, shipping and water resources, Nitin Gadkari talks about renewable energy, electric cars and waterway mobility.